As a chef, I know the importance of good nutrition – but I don’t always follow best practice! I know the value of a healthy breakfast, but when my day starts at 7am, I’m never ready to eat so I just have a quick coffee. While I’m still at home I put in orders via email for the day’s food at Westerham Place, the care home where I work in Kent. I live in Redhill, Surrey, and it’s a pleasant 25-minute journey in the car to Westerham. When I arrive at around 9.30am the first thing I do is check the fridges to make sure everything is available for the day’s meals. On an average day I spend the morning preparing lunch, then make afternoon tea, and finish off by preparing the evening meal which is generally served at around 6pm. It’s always pretty busy. There’s just me and a kitchen assistant, but the care workers are always on hand to help if ever we are under pressure. I’ve been at Westerham for 12 years, so I feel part of the family. It’s a warm and welcoming place to work, and I’ve got to know the residents extremely well. I know their food likes and dislikes, and make it a priority to get to know their families too. Food is an extremely important part of life in a care home. Mealtimes are a focal point of the day for everyone to come together in the dining room. Offering balanced, nutritious and sustaining meals makes a big impact on the well-being of older residents, as is well-evidenced by research. We have regular residents’ meetings and have feedback questionnaires so we understand how we’re doing. Menus are put together on a seasonal basis changing four times a year and on a four-week cycle. We source fresh fruit and vegetables from Covent Garden and almost all of our products are British and Red Tractor approved. Westerham is managed by Montreux Living and it supports chefs to obtain quality merchandise that results in varied and wholesome meals. 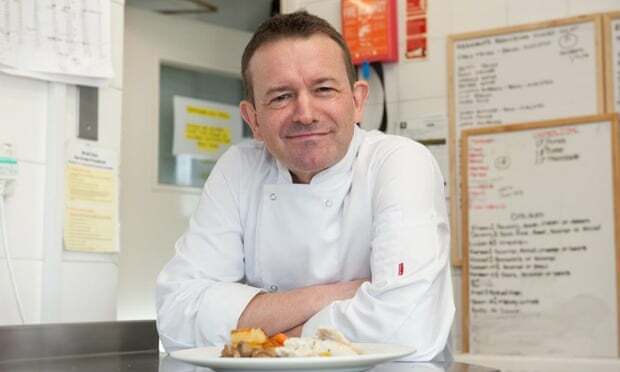 All in all, I’ve had an interesting catering career – I did my City and Guilds qualification at Guildford, and then wrote to Michel Roux, a Michelin-starred chef in London. I was lucky enough to be offered a job. I specialised in patisserie, and went to work at the Roux brothers’ patisserie laboratory in Wandsworth, where we made pastries for their restaurants. It was a fantastic grounding, and I got to visit the brothers’ three-Michelin starred restaurant, The Waterside at Bray in Berkshire, and mingle with the chefs. Michel Roux also arranged for me to go to the Patisserie Jean Millet in Paris, and I worked alongside Alain Roux, who is now the chef patron at The Waterside. After a spell working in Australia, I returned to England to open my own shop in Reigate in 1991, the Delicieux Patisserie. I ran the shop for 10 years, but then decided to sell up and find something more stable. I applied for the job as chef at Westerham Place, and discovered the care home manager at that time was one of my patisserie customers. She must have liked my work, because she offered me the job, and I’ve been there ever since. I love the work. It’s great to have a captive audience and to know exactly how many people I have to cook for each day! Because of my experience, I’ve just started visiting other Montreux Living care homes to share my knowledge and help train the other chefs. This has been a real pleasure. At the end of my day, after everything’s cleared up, I leave at around 7pm. I like to keep busy, so rarely go straight home – I play tennis, and try to keep fit by going to the gym. I recently bought a property in Spain, so I’m learning to speak Spanish and try to practise watching Televisión Española, which has some great soaps. I also like watching how the Masterchef franchise is recreated in Spain. But I try to be in bed by 11pm most evenings. Working as a chef is exhausting!